This is a goal that we continue to achieve through the warm welcome that is given at both churches now for all services, as well as having service booklets that explain the journey of the communion service, together with bookmarks and guidance from the incumbent for the Book of Common Prayer services. In order to move beyond this, we decided that we had to develop a Benefice logo which will communicate (in a dynamic but simple way) not only what we believe to be the Christian message for all people (both within the church membership and beyond) but also the journey into God’s infinite Love and eternal Presence. The Cross: The sign of the Resurrection of Jesus Christ which is the symbol of Christianity and brings hope to all. The Colours of the Cross: Based on the colours of Spiral Dynamics (which is an evolutionary system of growth based on understanding human nature through value systems), what is conveyed within the cross is the rich tapestry of life, and so we acknowledge the fact that everyone is not only different but also in their own stage of life development. We see difference not as something to fear, but something to embrace and rejoice in. Our value is that God loves everyone and so our aim is to meet people where they are and love them. We will welcome and include everyone, no matter what their colour, creed, and culture; whether they have faith or no belief system, both within and without our church walls. Our aim is to learn from each other and so all dynamically develop through being together. The Arrows: onwards and upwards! The Christian life is never static: it is about journeying on a pilgrimage of life which, through various experiences of ‘deaths and resurrections’ enables learning and development towards a mature, integrated state of being with the Trinitarian God. The ‘frayed edges’ on the left and base of the cross: these represent the open entrances into the journey of living in God’s love - no matter where or how one starts - whether that be through general inquiry or a spontaneous visit or through life’s gateways of baptism, marriage or funeral; or starting from rock bottom through depression, anxiety, illness, suffering, or breakdown. By coming into the dynamic, loving movement of God’s love everyone one is safe and can grow gently and gradually, knowing that we have Diocesan Safeguarding, Health and Safety, and Risk Assessment standards, procedures and policies in place which are stringently adhered to and appraised/updated annually. All those who care for children and vulnerable adults are DBS checked and attend mandatory safeguarding training. By the power of the Holy Spirit we know God’s love which draws us all together to face and live through the joys and difficulties of life. The Holy Spirit is the comforter, the Advocate, the counsellor, the Helper and ‘Parakletos’ (which in Greek literally means ‘by one’s side or wraps around to comfort and help). When one is filled with the energy of the Holy Spirit (whose presence was first celebrated 50 days after Jesus resurrected and we celebrate at Pentecost) the fruits of the Spirit is shown throughout God’s people: love, joy, peace, patience, kindness, generosity, faithfulness, gentleness, and self-control (Paul’s letter to the Galatians 5:22 – 25). God’s heart then beats through our love and care for each other. 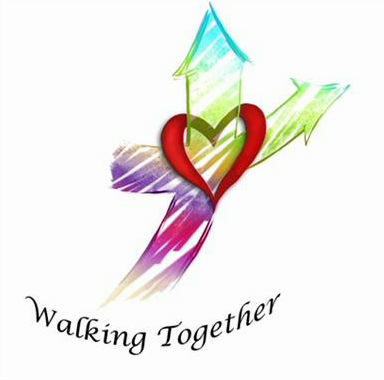 Walking together: Travelling together one step at a time, with consideration for those who struggle to ‘walk’; but nevertheless moving forward and purposefully working towards the goal of God’s peace and justice locally, nationally and internationally. The ‘smiley’ Walking Together reinforces the dynamic movement in the logo, but also makes the whole logo look like a curved anchor, suggesting that whilst we are anchored in our Trinitarian faith, there is nevertheless movement indicating that we are not stuck in our theology, doctrine, church practices, etc., but are always looking to learn more and more as we walk along. We don’t and we cannot know everything – that is part of the mystery of trying to be Christian.